Is Vermont’s secessionist movement a “green tea party”? A recent Huffington Post article, headlined “Vermont Revolutionaries and the Rise of a Green Tea Party,” drew the parallel between Glenn Beck’s antigovernment minions and the Vermonters who want to break away from the U.S. True, both movements have organized in reaction to what they perceive as runaway federal spending. Both view Washington as “broken.” And both are fielding political candidates for the first time this year — Vermont’s secessionists have a slate of 10 men running for governor, lieutenant governor and state House and Senate seats. But there’s one gigantic difference, says Thomas Naylor, founder of the Second Vermont Republic movement. While tea partiers think the system’s fixable, the secessionists believe America has become ungovernable — and that Vermont must break away from “the empire” to survive. 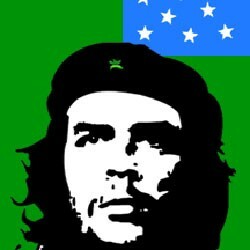 To drive the distinction home, the Second Vermont Republic last week added Che Guevara’s iconic visage to the green-and-blue flag that is its symbol. In fact, the loosely organized secessionist slate doesn’t come with one unified platform but with a range of viewpoints on how Vermont should “go it alone.” The secessionist candidates are running as independents, in part because their politics are all over the map. Gubernatorial candidate Dennis Steele, a hulking, Paul Bunyanesque web developer from rural Kirby, believes Vermont must abandon ship or be dragged down by the Titanic that is the sinking American economy. Steele’s singular goal is a two-thirds vote in the legislature to deliver articles of secession to Washington, establishing Vermont as an independent republic, as it was from 1777 to 1791. “What other choice do we have?” Steele asks. The candidate for lieutenant governor, 54-year-old car wholesaler Peter Garritano of Shelburne, was a lifelong Democrat until “annoyance with the empire” pushed him into the secessionist camp, he says. Earlier this year, Garritano posted a Craigslist ad under “government jobs” seeking candidates to run for the legislature. Two respondents are now on the ballot: musician Steve Laible, running for Senate in Chittenden County, and Champlain College adjunct professor Todd Pritsky, running for a House seat in Fletcher. Pritsky says he’s “sympathetic to the cause but not 100 percent committed” to the secessionist movement. Even less convinced is Gaelan Brown, a 34-year-old state Senate candidate in Washington County. Brown, who works for solar panel company groSolar and lives in Fayston, labels himself a secessionist but says his primary goal is making Vermont self-sufficient when it comes to food, energy and finance. “Vermont doesn’t have to secede to become a more sustainable state,” Brown says. At least one candidate on the Second Vermont Republic’s list sounds almost antisecession. Terry Jeroloman, a retired lawyer from Burlington running for state Senate in Chittenden County, decided to run after interviewing several secessionists on his local access TV show, “Vermont Today,” on VCAM. “I agree that we should talk about it and talk about the possibility of a vote [to secede] as a way of opposing the war,” he says. But Jeroloman was turned off by Steele’s uncompromising stance, he says, so much so that he recently removed the word “secession” from his campaign website. In fact, Jeroloman sits on the Progressive Party’s state committee and is backing Peter Shumlin, a Democrat, in the governor’s race. Filling out the slate of Senate candidates, and representing various secessionist stands, are business consultant Robert Wagner in Addison County; bouncer Mikey Van Gulden in Chittenden County; and businessman William Cruikshank and political activist Dennis Morrisseau, both in Rutland County. The youngest hopeful is House candidate James Merriam of Montpelier, a University of Vermont student and waiter who started attending secessionist meet-ups at the age of 15. Merriam was valedictorian of Montpelier High School in 2007 and made the case for secession in his graduation speech. Vermont’s ballot access laws make it easy for independent candidates to run for office. Candidates for governor and lieutenant governor need only 500 signatures from registered voters. For state Senate and House, the thresholds are 100 and 50 signatures, respectively. And yet the Second Vermont Republic has never before fielded candidates. Why? Nowhere on the ballot will the word “secession” appear; the term “independent,” which describes all manner of political orientations, serves as the all-purpose identifier. Naylor admits that poses a problem for voters unfamiliar with the secessionist candidates, and for candidates trying to clue in the electorate to their unusual platform. “The vast majority of people in the state will not be aware,” Naylor acknowledges. Frank Bryan, a UVM political science professor who spent years arguing for Vermont’s secession, says running candidates was always a goal of the movement. But he argues its current approach is wrong. What candidates like Dennis Steele should do, Bryan argues, is run for school board and city council before seeking statewide office, to establish a record, gain experience and earn the trust of voters. Naylor calls that argument “totally absurd. Naylor knows his candidates face an uphill battle. Even though one UVM poll suggested 13 percent of Vermonters favor secession, he doesn’t expect that to translate directly into votes. Naylor would be happy if Steele got 10 percent, he says, itself a lofty goal.